Before baking the bread, I knew that I had to figure out how the different ingredients would affect the density and texture, particularly because I was using whole wheat pastry flour and honey. What’s whole wheat pastry flour? Whole wheat pastry flour is soft white whole wheat flour that is finely ground. It’s a low-protein flour, which helps to produce soft baked goods similar to cake flour. I like baking with it because you still get the nutritional value since it’s made with whole grains, but it also will give you perfectly textured baked goods. If you don’t have whole wheat pastry flour on hand, you can sub 1/2 whole wheat and 1/2 all-purpose in the recipe to produce somewhat similar results. My favorite whole wheat pastry flour is Bob’s Red Mill Organic Whole Wheat Pastry Flour. Tips on baking with honey: Honey has more fructose and a higher water content compared to regular sugar, which means that it’s naturally sweeter. Thus I decided I would only use 1/3 of a cup of honey in my recipe. Additionally foods made with honey will also brown quicker so instead of baking my bread at the regular temperature of 350 degrees, I chose to bake it at 325 degrees to avoid burning the crust. 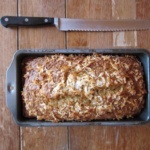 It’s important to note that in this recipe, the top of the bread will be very golden brown and form a crust, but it gives great flavor to the banana bread. Another great perk? This bread is uber healthy and great for freezing for those mornings when you’re on the go. To keep the bread moist and to save calories I used nonfat plain greek yogurt (plain greek isn’t loaded with additional sugar or carbs). I’ve posted the nutritional information in the recipe below. I love serving the bread slightly warm and spread with almond butter. 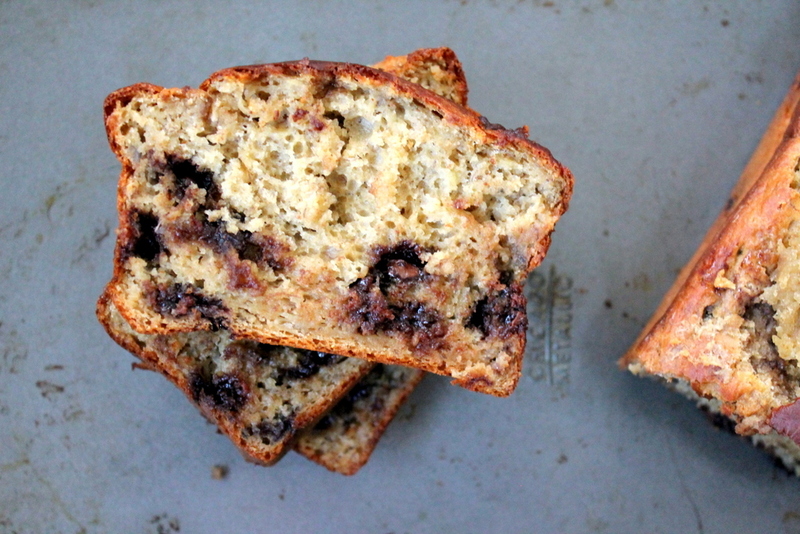 Every time I bite into a slice, I’m overwhelmed by the delicious banana flavor with melted bits of chocolate chips. Sometimes if I’m feeling craving a sweet snack, I toast my bread and heap on that lovable Nutella. However it’s done, KIDS simply adore this bread and I’m sure you will too! Banana bread made with whole wheat pastry flour and chocolate chips. Delicious, good-for-you, and easy to make! Preheat oven to 325 degrees F. Grease a 8x4 or 9x5 loaf pan with cooking spray. In a large bowl, whisk together flour, baking powder,baking soda, and salt; set aside. In a large mixing bowl, combine mashed banana, honey, greek yogurt, olive oil, almond milk and vanilla and beat on low until smooth in consistency. Add in the egg and egg white and beat again until well combined, about 1 minute. Add the banana mixture to the flour mixture and combine until moist -- It's important to not over mix! Next gently fold the chocolate chips into the batter. Spoon all of the batter into the greased loaf pan. Bake at 325 degrees for 45-60 minutes or until a tester inserted into middle of the bread comes out clean. The length of time will vary based on which loaf pan you use, so I suggest checking the bread at 45 minutes. Also, don't fear the golden crust! The bread may look done on the outside, but the inside is what's important -- you don't want a gooey bread. Once a tester inserted into the bread comes out clean, cool for 10 minutes in pan on wire rack, then remove from pan gently and cool completely on wire rack. Cut into 12 slices and enjoy! If you'd like to freeze your bread, simply wait until bread is completely cool, then slice and individually wrap in cling wrap and place in the freezer. Once ready to eat, just toast or microwave your slice and spread with your favorite topping. 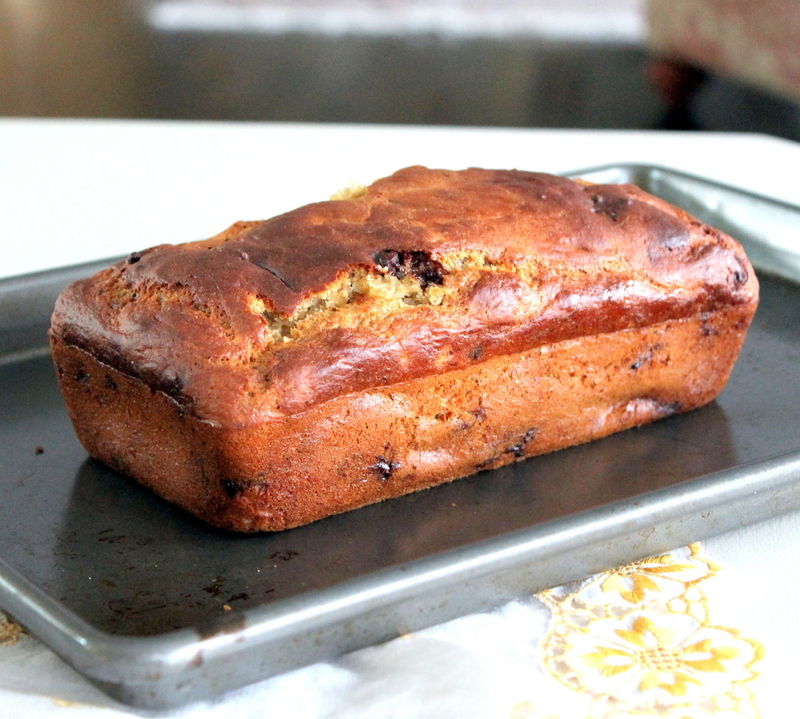 96 Responses to "Honey Whole Wheat Chocolate Chip Banana Bread"
Gorgeous looking banana bread and I never bake banana bread with wheat – regular bread, rolls, pizza crust, etc with wheat flour yes, but not banana bread. I should try. Love the discussion in WW Pastry Flour & Honey, too! This looks fabulous. I'm always looking for ways to include wheat and healthier options to get an equally delicious food without the bad stuff. You are amazing and I can't wait to try this! Thanks Dawn, also if you’d like to make it even healthier — replace the chocolate chips with blueberries! Would you use the same amount of blueberries? Melissa Henry I am going to make this soon and if you want I may be able to ship you one sweetie let me know. Looks like another winning banana bread! This is so wonderful looking. I don’t think it’s possible to have too many banana bread recipes. Plus, it’s got chocolate! Ok – this looks DELICIOUS and I cannot wait to try it. By the way my daughters and I made some of your yummy cookies and YES we used browned butter for Christmas and they were a hit with a capital H.
Thanks for all the info on honey whole wheat flour. I’m definitely going to have to try this! I love experimenting with banana bread – I go through so many bananas on a weekly basis, that there’s always room for another recipe. I love that you used whole wheat pastry flour – the result looks so light and tender and that crust is fantastic. 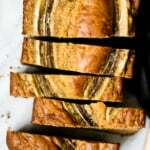 Wonderful looking Banana Bread!! Ihad never tried one, so i wand to try this one.In Greece, we dont have this special flour, So I will sub it as you say.But also we have not vanilla almond milk, with what can I sub it?Thanks for all the info you provide to yous recipes, its a great help if you dont have all the same ingridients. Gorgeous! 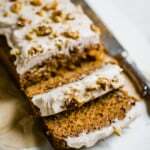 I’ll just sit as patiently as possible and wait for my bananas to be ripe enough to make this. I learned a lot about flour in this post- thanks! omg adding this to my list! i can’t believe how healthy you made it! Yum! I have no idea where to get whole wheat pastry flour in Australia so whenever I use regular whole meal flour in baked goods, even in a smaller quantity than white the texture never comes out right or dry. I’ll try this and hope for the best! Would regular milk work instead of almond milk? I don’t generally have that on hand, and I’m not sure I’d want to buy it for one recipe! But this looks soooo good! I am going through a big phase of using honey in my recipes. This looks so lovely! 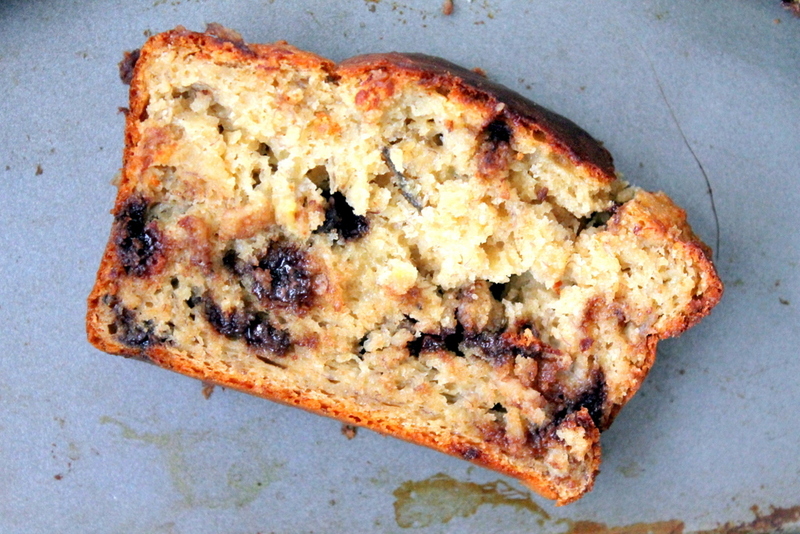 Have you ever made a healthy banana bread using almond flour or coconut flour? I’ve experiment with pumpkin breads that turn out pretty nice but haven’t tried it with bananas yet. Let me know! I haven’t really experimented with banana bread and coconut or almond flour. I bet it would be super moist! Delicious and healthy recipes are always a plus in my book!! Oh my lanta! I’m so happy I stumbled on this recipe in time! 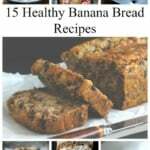 My bananas had ripened something fierce and I was preparing to make a traditional banana bread but once I saw this recipe I opted to try something different and healthy. And I’m glad I did! You do not miss the butter or oil or white sugar in this recipe AT ALL! It is so lovely and tasty, goes fabulous with tea and I cant wait to have a slice for breakfast tomorrow morning! I usually use whole wheat flour when I bake but I combined all purpose and whole wheat for this recipe, and as always doubled the salt. Also threw in some chopped walnuts I had on hand. Wonderful! Great job with this one!! Hi Rose, I’m so happy you loved it! Thanks for reading. Making this for a brunch on Sunday- can’t wait. Monique- you are seriously amazing. I still remember having lunch with you one day (last summer?!) and you said you were going to start a food blog. Amazed at all you’ve done! What a sweet comment! Thank you Katie — we still need to get coffee and catch up soon! Only 168 calories per piece? Really? I found your site through a random Google search and am so glad! I was in the mood for pumpkin bread, so I swapped 1c of pumpkin purée for the banana and let me tell you, the bread was TO.DIE.FOR! I ate four slices this morning! That’s awesome — I’m glad it works with pumpkin too! I made this with whole grain pastry flour (I don’t know if that’s really any different from whole wheat – it was the only thing I could find at the store!) and it was amazingly delicious. Thanks for the great recipes! 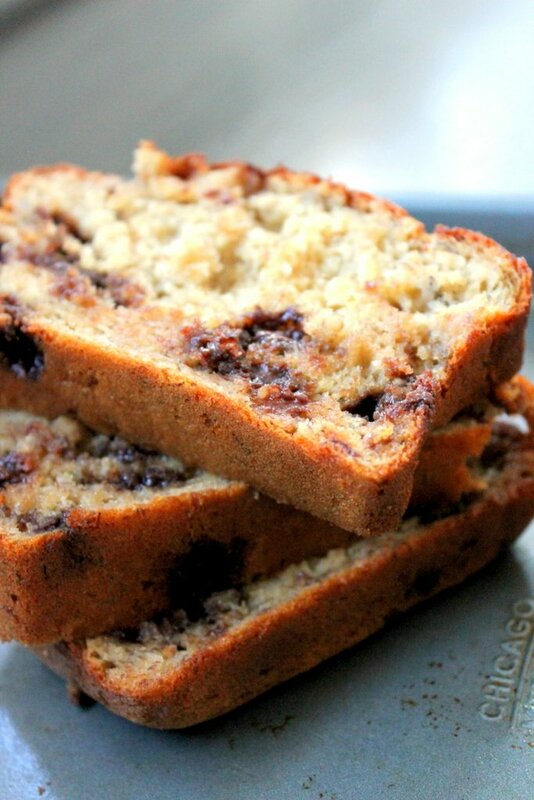 This is a very yummy chocolate chip banana bread recipe. I found this recipe and I had to try it. I am trying to go all whole wheat because I am diabetic. I loved that recipe used honey instead of sugar. However, I didn't realize my honey went bad so I used agave nectar instead and regular milk instead of yogurt (I didn't have any). Despite the changes it is delicious! Thanks you! I made this a few weeks back in muffins, they were to die for the whole family loved them. It was especially delicious warm spread generously with peanut butter! I kinda guessed the cooking time, what would you recomend for future purposes? Jamie! So happy you enjoyed it. My favorite part about this bread is that it’s healthy and delicious! just made this with chocolate and peanut butter chips, and milk instead of almond milk. WONDERFUL. best banana bread I’ve ever had. the outside makes the most delicious crust. thank you! This was the most amazing banana bread! I love it..can't wait to try more of your recipes. 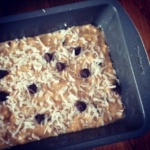 I just tried a slight variation of this recipe…omg! I am about to spoil my dinner because I can't stop eating this!!! Used whole spelt flour instead and it works great too! Also used a cheese grater to shave pieces of dark chocolate since in Germany there arent really any chocolate chips. Sooo delicious. I didnt know I could bake. 🙂 Thanks! This is lock-this-in-the-closet GOOD! Based on what I had, I used plain ol' yogurt, skim milk and white organic pastry flour and mini chocolate chips. So. Darn. Yummy! I’ve made this 2x within the past 2 weeks and it is absolutely delicious! Thanks for the fabulous recipe. I’m looking forward to trying a few of your other recipes soon! I do substitute the almond milk, only because we don’t have it readily on hand. My 3 year old has been helping make it, and when I asked him if we should take a slice to grandma, he said “No, I don’t want to share with her, not with anyone. I want it ALL for myself!” LOL. We want to cook this for Thanksgiving, but some of the people can't eat dairy. What can we substitute for the yoghurt? Just made this and am amazed by how good it is. My mom could not believe there was no butter or sugar in it, and this has officially become my family’s new go-to banana bread recipe. Bravo! Also, just curious, what does the olive oil lend to the bread? Is it for flavor or consistency? THe olive oil adds a little fat to the bread – which makes it extra moist! I’m so happy you loved it! Well, it took me a year to make it, but I did and it’s fantastic! Love, love, love it! Thank you so much! I love that it has so little oil and yet it is so moist! Definitely will be making it again. Hi Monique! I made this once and it was a huge hit with my office! 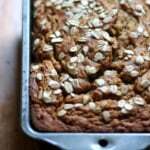 I was wondering if this recipe could be used to make 12 muffins instead of a loaf? How do you think the cooking time would differ? Thanks so much!! Yes they can! Bake at 350 for 18-22 minutes! Made a loaf of this scrumptious banana bread yesterday afternoon and it’s now morning (the next day) and it’s almost all gone! This is by far the best healthy banana bread I’ve ever made 🙂 And very good advice about not taking the bread out of the oven before it’s definitely completely cooked through on the inside. Far too many times have I been tricked into thinking my banana bread’s ready due to its golden crust, only to realise it’s all gooey and undercooked on the inside.. not nice :S Thanks again Monique! My husband just told me that this is the best banana bread I’ve ever made. Thanks! Thanks for this great recipe. How many slices total is that calorie count based on? Whole wheat flour should be fine, you may need to add a splash more milk as whole wheat flour is much more dense. And I would not recommend subbing chocolate chips for chia/flax. You could leave the chocolate chips out and add in 2 tablespoons of chia seeds/flax if you like. Just wondering if you can use coconut yogurt instead of Greek yogurt? 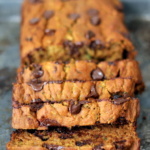 BEST healthy banana bread I have EVER had!! Used regular whole wheat flour, two whole eggs and 4 very ripe bananas. No chocolate. Just walnuts and cranberries. I made these into muffins and baked for 35-40 minutes. Perfectly portioned and portable! My husband and son beg me to bake them every weekend! Love love love!!! 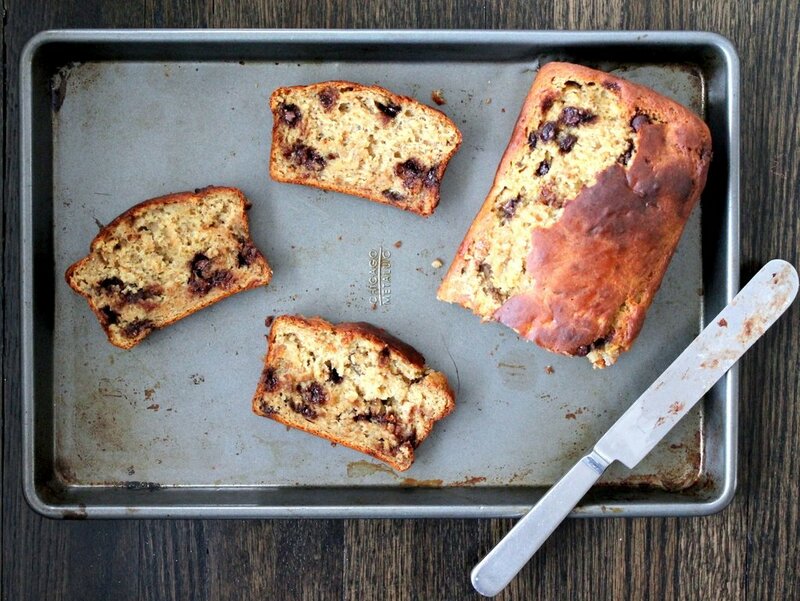 Thanks for an amazingly healthy AND delicious banana bread recipe! Hi! Just wondering if you’ve ever tried this with low-fat or full-fat greek yogurt (usually what I have on hand)? Thanks! Another delicious recipe–thanks! My aunt is a beekeeper and I love finding a fitting use for a special ingrediant. So glad you (and family) love this one Jenny!! Hi, I’m unable to have dairy, can you recommend a substitute? Would applesauce work? Thank you! Hi Jennifer – you can try almond milk or coconut milk! I made the bread last week. Delicious!!!! So I turned them into muffins and they still came out slammin’! You rock!!! !